JOHANNESBURG (miningweekly.com) – Precious metals mining company Sibanye-Stillwater announced on Thursday that it had entered into an agreement to presell gold to Citibank for R1.75-billion ($125-million). This follows Wednesday’s raising of a similar amount on the sale of 5% of the issued shares of the Johannesburg- and New York-listed company, which has R10-billion ($700-million) in undrawn facilities. Sibanye-Stillwater CEO Neal Froneman said in a release to Creamer Media’s Mining Weekly Online that the gold prepayment and the equity raise were strategic and pre-emptive levers to enhance balance sheet flexibility, ensure appropriate positioning and render the company sufficiently robust to endure any exogenous challenges. Sibanye-Stillwater’s gold mining operations have been impacted by a five-month strike by members of the Association of Mineworkers and Construction Union. Its domestic platinum operations will enter sector wage negotiations towards mid-year. A total of 105 906 oz of gold have been presold to Citibank at a floor price of $1 200/oz and a cap price of $1 323/oz. These ounces are scheduled for delivery during the last quarter of this year. 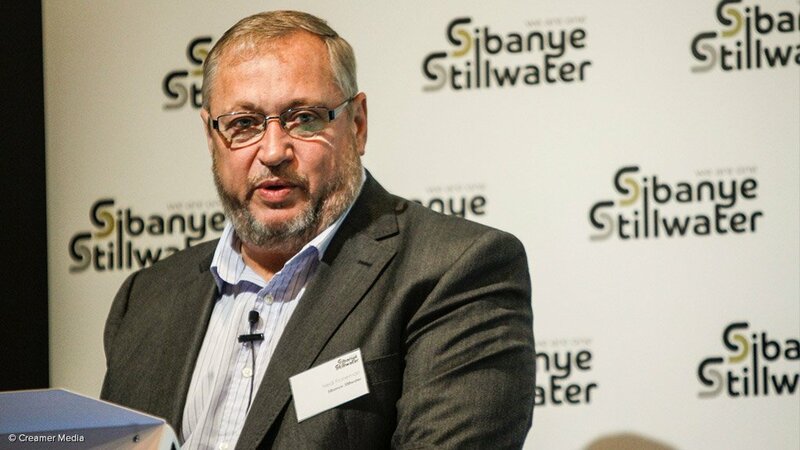 Sibanye-Stillwater said on Tuesday that it expected to report gold production of 104 000 oz for the first quarter of this year, equating to 90% of what was planned under the strike conditions and 36% of the gold produced in the first quarter of 2018. Its Kloof gold mine still has 15 years of life, parts of the Driefontein gold mine have five to ten years of remaining life, the Beatrix gold mine also has ten years of life, and South African platinum group metals (PGMs) mines have 30 to 40 years of remaining life. The company employs 60 000 personnel, a figure that will rise to 90 000 with the acquisition of PGMs mining company Lonmin.